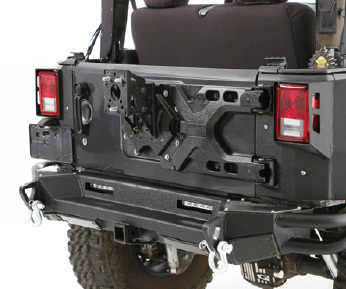 Smittybilt is proud to introduce their new Pivot Heavy Duty Oversized Tire Carrier and Tailgate Reinforcement System that is engineered to hold up to a 37-inch spare tire. The monoblock aluminum construction is combined with forged chromoly mounting brackets for the ultimate in strength to eliminate tailgate sagging and rattles, even while holding up to 135 pounds. The new Pivot Heavy Duty Oversized Tire Carrier triangulates the tailgate mounting and body tub hinge points using existing mounting holes to distribute loads across a wide area while maintaining the easy single action opening and closing of the tailgate.